I have talked about the WS2000 knife sharpening attachment in the past, and I have just recently talked about the new WS3000 knife attachment, but both of those require you already owning one of the two Work Sharp Sharpeners. 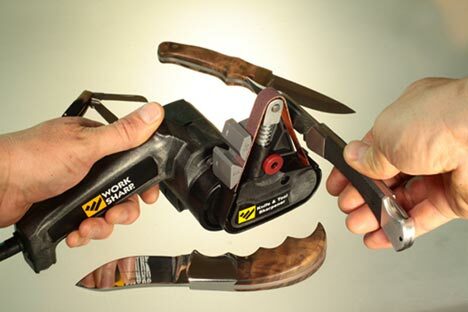 For those of you that just want to sharpen knives, Work Sharp has a much cheaper solution with the stand alone Knife and Tool Sharpener(Model WSKTS). The WSKTS is almost identical in function to the attachments for the Work Sharp Sharpeners, just at a much smaller scale. In fact, the smaller width of the belts might even offer a better sharpening solution to some of the more complex blade styles. The system works by using a sharpening guide at either 50 degrees for hunting & outdoor knives, or 40 degrees for kitchen knives to hold the blade, while one of the abrasive belts spins with the help of a 120 volt motor to do the sharpening. Using the three abrasive belts, 80 grit, 220 grit, and 6000 grit, ensures that you get a razor sharp edge on straight bladed knives, curved knives, tanto blades, filet knives, serrated knives, gut hooks, and more. The system even does scissors, or you can remove the guide and go completely freehand.